Derby County dominated but could not find a way past Nigel Clough's gutsy Burton Albion side, who earned a point from their first game at Pride Park. 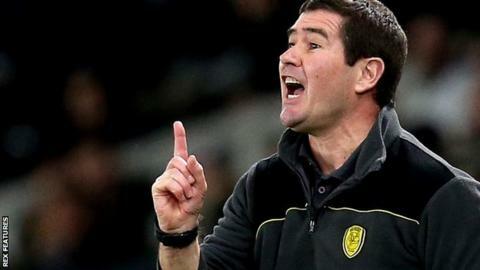 Brewers boss Clough, who was sacked by the Rams in 2013, masterminded a display that ensures the hosts slipped 10 points outside the play-off spots after three home games without a win. Darren Bent wasted Derby's best chance, somehow shooting over from two yards. Burton frustrated the hosts after the interval but barely threatened. The closest they came was when former Rams attacker Luke Varney headed an effort straight at Scott Carson just after Bent's miss. Jacob Butterfield did force a fine save from visiting keeper Jon McLaughlin after the interval, but they could not create a telling opportunity and Burton held on for a point which takes them five points clear of the Championship relegation zone. "We are very disappointed with two points from three games when our home form has been excellent. We talked about a target but we've not achieved that. "It was a yellow brick wall of four and six but I can't fault the players, we kept plugging away but it wasn't our night. "Burton came for a draw and got it and it's been a frustrating night all round. Sometimes you can play for two days and not score and I think that was the situation tonight. "When we came here we were fourth bottom and just dreaming of getting away and the players have done a marvellous job to go on a run, but I knew after the first three or four games this would be a frustrating season." "Proud is a bit of an understatement. It's incredible. We worked incredibly hard, we're honest enough to say we came for a point and for us to get that at Derby is absolutely unbelievable. "That's what we are all about, honesty and hard work. We're not particularly good at times and the players will tell you that as well, but we dig deep and everybody works for each other. "Nigel is in the dressing room, it's quite an emotional day for the gaffer. We had four magnificent years here, love the club and the fans so it's very emotional coming back for the first time and little Burton have taken four points off them so we're delighted. "We didn't want to lose tonight, we set up for a point, worked all week training to get a point so I think it's good management really because we are going home with a point." Match ends, Derby County 0, Burton Albion 0. Second Half ends, Derby County 0, Burton Albion 0. Attempt missed. David Nugent (Derby County) right footed shot from the centre of the box is close, but misses to the left. Assisted by Darren Bent with a headed pass. Foul by Julien de Sart (Derby County). Lloyd Dyer (Burton Albion) wins a free kick on the left wing. Corner, Derby County. Conceded by Lloyd Dyer. Tom Ince (Derby County) is shown the yellow card for a bad foul. Foul by Chris O'Grady (Burton Albion). Attempt blocked. Tom Ince (Derby County) left footed shot from outside the box is blocked. Assisted by Cyrus Christie. Corner, Derby County. Conceded by Jon McLaughlin. Attempt saved. Tom Ince (Derby County) right footed shot from a difficult angle on the right is saved in the bottom right corner. Assisted by David Nugent. Attempt missed. Marvin Sordell (Burton Albion) left footed shot from outside the box misses to the right. Assisted by Tom Naylor. Substitution, Burton Albion. Chris O'Grady replaces Luke Varney. Marvin Sordell (Burton Albion) wins a free kick on the right wing. Corner, Derby County. Conceded by Luke Varney. David Nugent (Derby County) wins a free kick on the left wing. Substitution, Derby County. David Nugent replaces Will Hughes. Offside, Burton Albion. Tom Flanagan tries a through ball, but Luke Varney is caught offside. Offside, Derby County. Alex Pearce tries a through ball, but Darren Bent is caught offside. Abdoul Camara (Derby County) wins a free kick on the left wing. Attempt missed. Lloyd Dyer (Burton Albion) left footed shot from a difficult angle on the left misses to the right. Attempt saved. Tom Ince (Derby County) left footed shot from outside the box is saved in the top centre of the goal. Assisted by Jacob Butterfield. Attempt blocked. Abdoul Camara (Derby County) left footed shot from outside the box is blocked. Assisted by Jacob Butterfield. Attempt blocked. Jacob Butterfield (Derby County) left footed shot from outside the box is blocked. Assisted by Will Hughes. Attempt blocked. Julien de Sart (Derby County) right footed shot from outside the box is blocked. Assisted by Max Lowe. Corner, Derby County. Conceded by Marvin Sordell. Substitution, Derby County. Abdoul Camara replaces Ikechi Anya. Substitution, Burton Albion. Marvin Sordell replaces Cauley Woodrow. Attempt missed. Tom Ince (Derby County) left footed shot from the right side of the box misses to the left. Assisted by Jacob Butterfield.